What if the Best Financial Advisor is a Dog? The strange part of the story is that Max Tailwagger was merely 5-years old at the time of his nomination, which seems young to be providing financial advice (and if you do the math, less than 2 years old at the time of his first award). The even odder part is that Max is a dog. 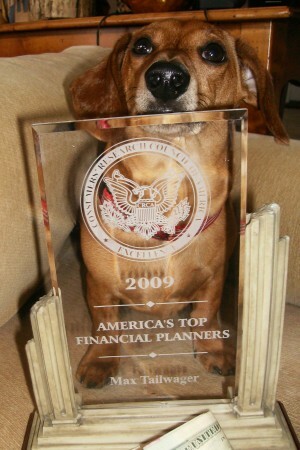 Max’s owner, a finance professor and author named Allan Roth, first drew attention to the guise of these awards in 2009 when Max was pictured with his award as one of America’s Top Financial Planners. This story, and the more recent update this October, simply highlight that industry awards for “Best Financial Planners” or “Top Financial Advisors” require little more than a pulse and a checkbook. Several other articles have exposed the trivial or opaque requirements of these awards, including the Barron’s “Top 100” list which requires payment to be considered for the award. An investment advisor friend in Atlanta recently blogged about the almost-complete lack of criteria for Atlanta magazine’s Five Star Wealth Manager list (to which he was named) other than being employed as an advisor, not being an awful crook (a “favorable regulatory and complaint history review”), and accepting new clients. 2) achieve a passing grade on the Series 65 exam. Becoming an investment advisor requires no mandatory coursework and not even a high school diploma. The only real requirement, the Series 65, is an exam not on the fundamentals of financial planning or tax or investments but on securities law. While there is no single authority on the average time commitment to pass the exam, a quick Internet search will likely lead you to the conclusion that this exam can be passed with 5-10 cumulative hours of preparation. Financial advice consumers are faced with a real dilemma. Industry rankings or “best of” lists are fabricated, the industry’s barriers to entry are laughable, bogus designations cloud the profession, and consumers are not even clear on who is required to meet a fiduciary standard and work in their best interest. Consumers are confused and rightfully so. Without proper minimum standards to practice, the industry tarnishes itself and consumers lose trust in the profession. Is it any wonder that financial advisors are among the least trusted professionals, barely ranking above politicians, mechanics, and taxi drivers. A healthy debate can be had about what problems in the financial advice industry need to be fixed or how to help consumers make an informed decision when choosing an advisor but the biggest impediment to the profession is the lack of any serious requirements to practicing in it. While we risk overusing medical industry analogies, imagine if obtaining an MD was a voluntary, not mandatory, step to practice as a physician. Would you visit a doctor that did not pass the boards or never attended medical school? You might do so for a basic evaluation or a physical but not likely if you needed surgery. Moving to provide more clarity for the public in a sea of financial designations with widely-variable qualifications, the National Association of Personal Financial Advisors (NAPFA) has decided to recognize the mark that best represents financial planning professional standards. Effective January 1, 2013, NAPFA will only accept the Certified Financial PlannerTM (CFP®) designation for those applying to be NAPFA-Registered Financial Advisors. Another industry heavyweight, Financial Planning Association (FPA), states that it “believes that everyone who holds themselves out as a financial planner should pass the Certified Financial Planner exam and be a CFP® certificant.” Importantly, a minimum standard impedes the entry of incompetence into an industry, which is specifically why respected professions set high minimum standards. 1) Demonstrates a minimum level of competence. The CFP® designation requires the completion of a lengthy coursework curriculum covering the most fundamental areas of financial planning and concludes with a rigorous 10 hour exam. To use FPA’s language, it is the mark that best represents financial planning professional standards and provides for a certain level of competence in those standards. 2) Sets a fiduciary standard. The CFP Board holds professionals to the Standards of Professional Conduct and requires that CFP professionals work in the best interest of their clients. The reality is that the CFP® designation should not be the only filter for consumers but it does narrow the playing field to make screening advisors a little less onerous. Just as there are doctors and attorneys who do not deliver the best advice or may not maintain the highest competency, the same is and will be true of CFP® certficant advisors. The important concept is that the CFP® serves as a minimum standard for financial advisors, not the best standard. Ideally, policy makers will move to require the CFP® designation as a minimum standard for practicing as a financial advisor. Short of that step, the burden falls on consumers to demand that financial advice come from individuals who have demonstrated the competence to give it. At the very least, setting the CFP® designation as a minimum requirement ensures that you won’t be going to a dog for financial advice.